Many novelists have heard of Scrivener, a software for writers. Initially it was available only for Mac, but last year a version for Windows became available. While editing one of my novels lately, I became frustrated with keeping all my documents and Excel charts updated, and trying to reorder scenes or chapters for a major revamp is a big pain in Word. So I finally decided to download the 30 day free trial for Scrivener. The next day, my husband told me to go ahead and buy it, since we had both read a lot of great things about the software, and I couldn’t stop gushing about all the tools and features. I’ve imported that manuscript I’m revising, and have a newer WIP (only a few scenes written) transferred over to work on mostly from scratch. It’s a very different process for each. One of the biggest features of Scrivener is that it you break each scene into its own document, but it can still be easily viewed in chapters, or the entire project. It’s been a LOT of work breaking my manuscript into individual scenes, and filling out the attached notecards with updated summaries, but it is SO worth it. 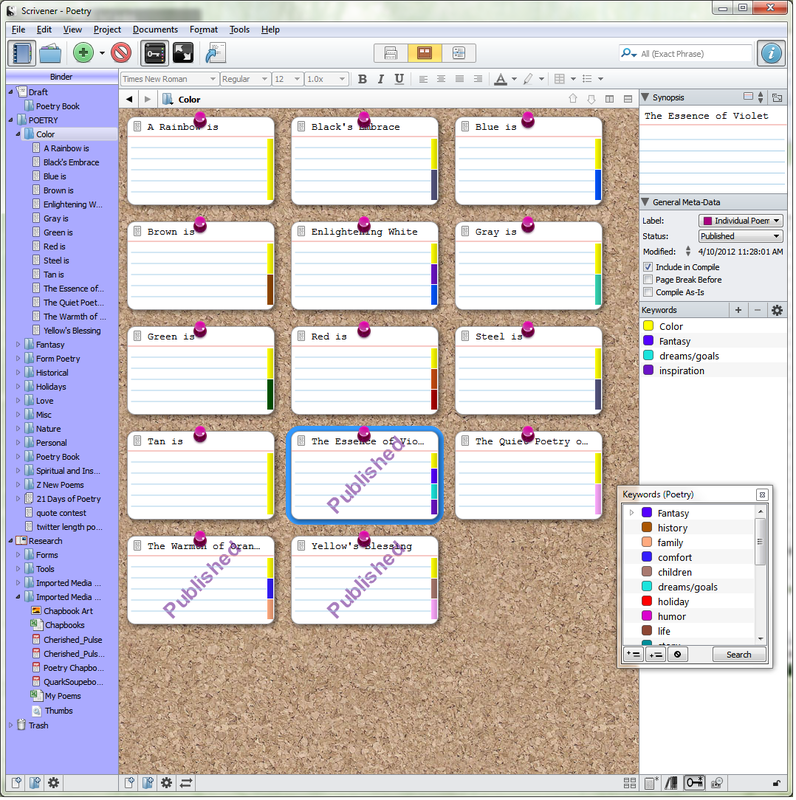 I can easily drag and drop a scene into a new location, I’ve used keywords which color the notecards so I can see POV at a glance, and the time I spent summarizing scenes has given me a basis for an updated outline and synopsis. I love having everything in one place. I used to have documents for characters, world building, different drafts; Excel sheets for keeping track of word count, Point of View, chapter length. Timelines and chapter outlines were a number of drafts out of date. With the ease of having all my info readily available, in one program, I can easily keep everything up to date, find what I need, and move things around. But that’s not all! I had the brilliant idea while fiddling with my manuscript that I can use these same features for my poetry. I can use keywords to categorize my poems, put them in collections, and easily reorder poems for compiling into a chapbook. No more copy/paste in a giant word document. If I want to work on an individual poem, I can. If I want to see how it fits into a larger body of work, I can do that too. My old method: Over a dozen folders, sometimes with a poem in multiple locations. Separate Excel sheets for information like theme. Not only a mess, but I never seem to have everything up to date. I forget to add a poem to my themes list. I have poems in my “new poems” folder for as far back as 2006 that I haven’t gotten around to categorizing (pure laziness, as I do have a miscellaneous folder). Now: I write a new poem, tag it with themes, and mark it as a rough draft. 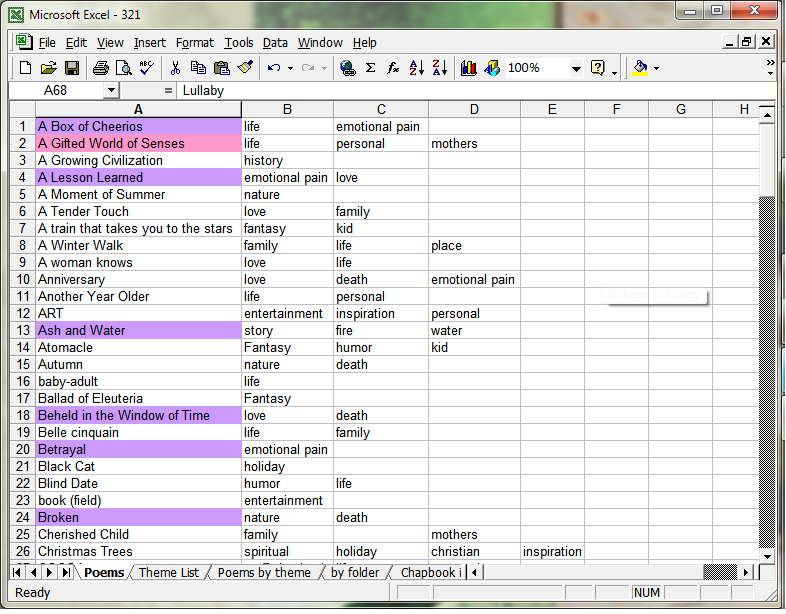 I could even list in the notes, or keywords, which poems I’ve shared with whom. I never can remember which ones I’ve shared with my husband, or my critique group. I love being able to have all that information in one place. If I can’t view it at a glance, it’s only a quick click away. 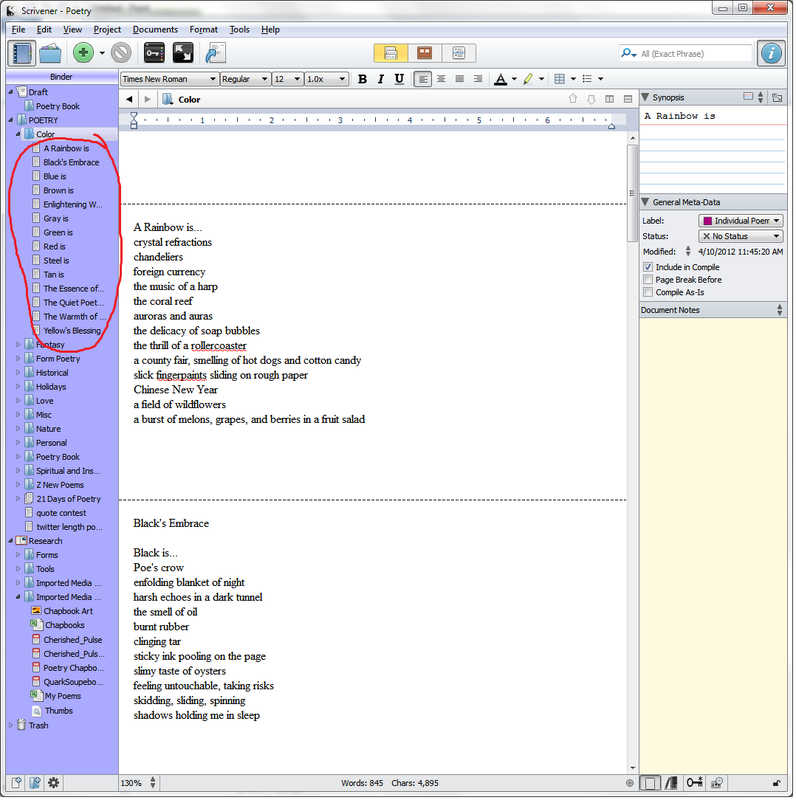 In this same folder, all I have to do is click on the Scrivenings button up top (highlighted in yellow below) to see the composite of all the text. I’ve circled in red the binder on the left, where I can drag documents to rearrange them, which would update the composite text, as well as the corkboard and other views. If you can’t tell, I LOVE Scrivener. It’s become such a useful tool, not only for my novels, but for my poetry as well. I’m super excited to put together a new chapbook now. What writing software have you tried? Mary, I’m wary of anything like Scrivener with a proprietary format, as it lacks portability and is confined to a single computer .. however, using it to put together poetry collections does sound interesting.